Homemade Buttercream Frosting is one of the best basic recipes to have on hand. This classic recipe makes enough pillowy frosting for 24 cupcakes or a 9-inch layer cake. Of all the recipes on My Baking Addiction, this Homemade Buttercream Frosting is definitely the recipe that I make the most in my kitchen. In fact, it’s probably the most requested recipe amongst family and friends – well, maybe the second most requested next to My Favorite Chocolate Chip Cookies. Whether I’m whipping up cupcakes, cake, or cookies, this Homemade Buttercream Frosting is the perfect way to top just about anything. I can’t tell you how many times people have said, “I could eat this with a spoon!” And I’ve actually made this for my aunt’s co-worker to do just that. She would put a serving in a little bowl and snack on it while watching her favorite TV shows. 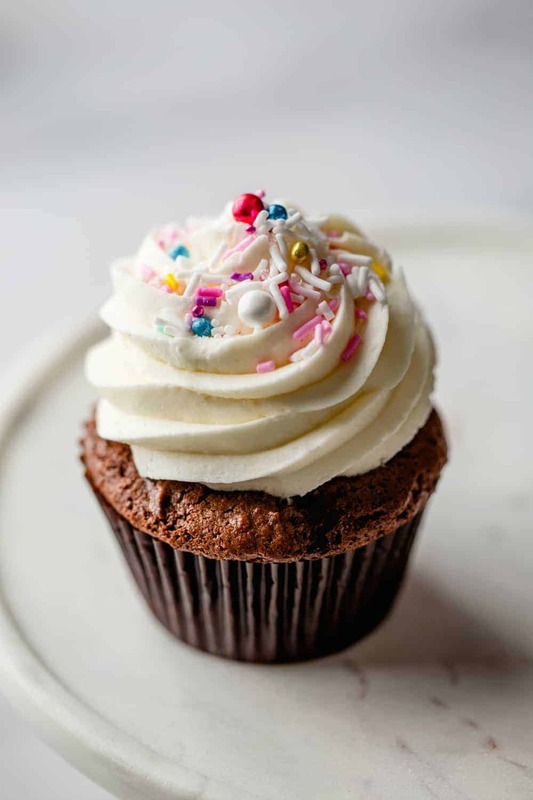 One of the most common questions that I get from my readers is about buttercream frosting. Although I have made several types of buttercream frosting recipes, this Homemade Buttercream Frosting is by far my favorite due to its flavor, simplicity, and smooth texture. This buttercream recipe can be infused with many different flavors to accompany your baked goods. There are many variations of recipes for buttercream. I prefer using unsalted butter for the fat component because I find it to be less greasy than buttercream made with shortening. However, to each their own; if you’re a shortening fan, see the notes in the printable recipe card for this adaptation. 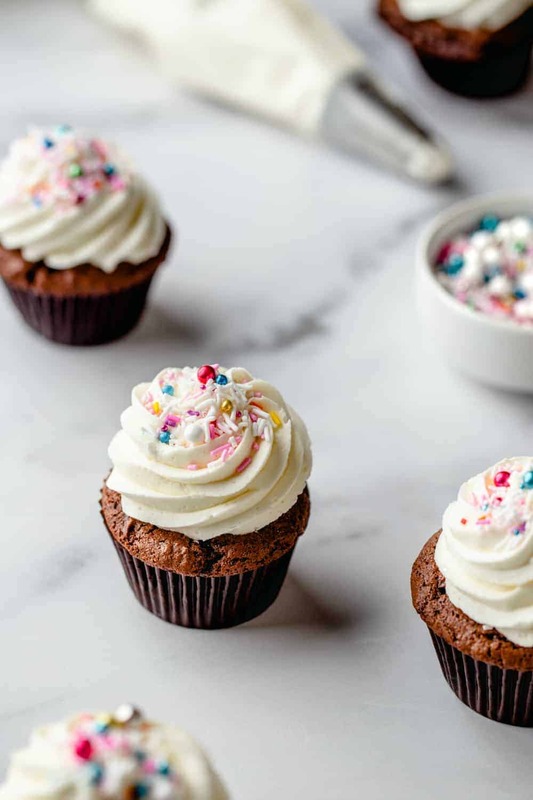 This Homemade Buttercream Frosting is extremely easy to pipe on 24+ cupcakes or a 9-inch layer cake and holds its shape very well. It will flow easily through a variety of piping tips. 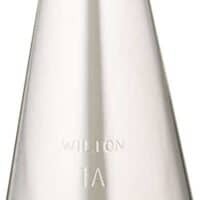 My favorite tips are the 1M from Wilton, large round and large French tips. 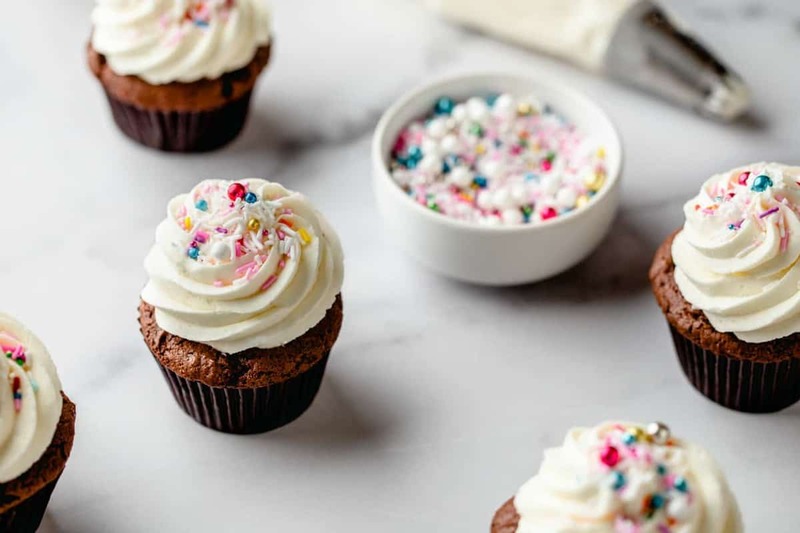 With this basic homemade buttercream recipe under your belt, you’ll be well on your way to creating cake and cupcake masterpieces. American Buttercream Frosting – This buttercream is fast, simple and what you see on most grocery store cakes. It’s essentially fat (butter, margarine, shortening), confectioners’ sugar, and vanilla extract whipped together. 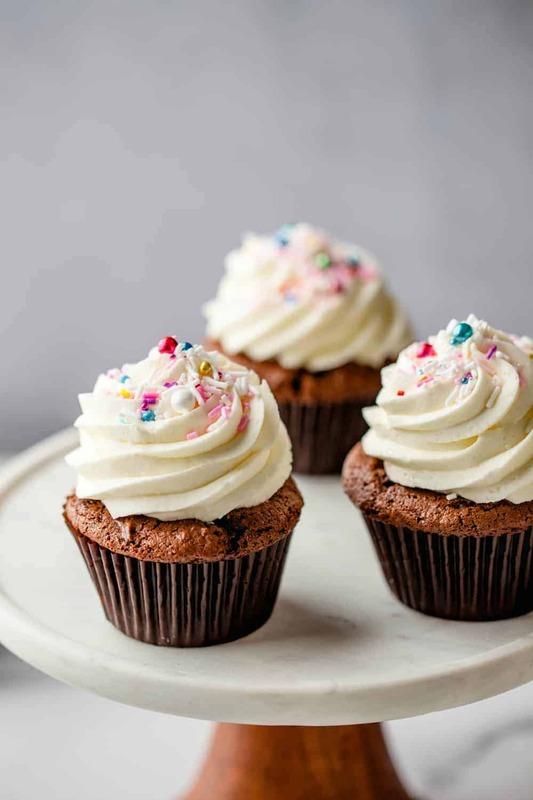 Swiss Meringue Buttercream – This type of buttercream in made by cooking egg whites and sugar together in a bowl placed on a pot of boiling water. 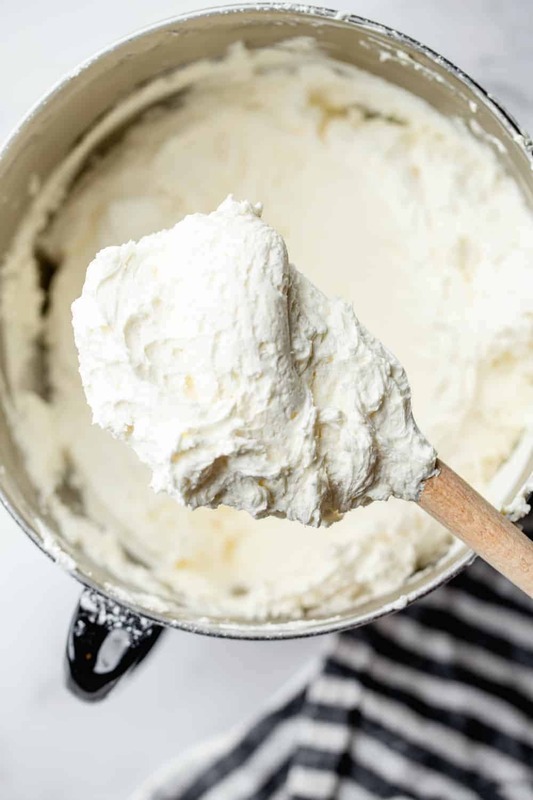 The mixture is continuously whisked while it reaches 140° F. The egg white and sugar mixture is then removed from the heat and whipped at high speed until it forms stiff peaks and has cooled. 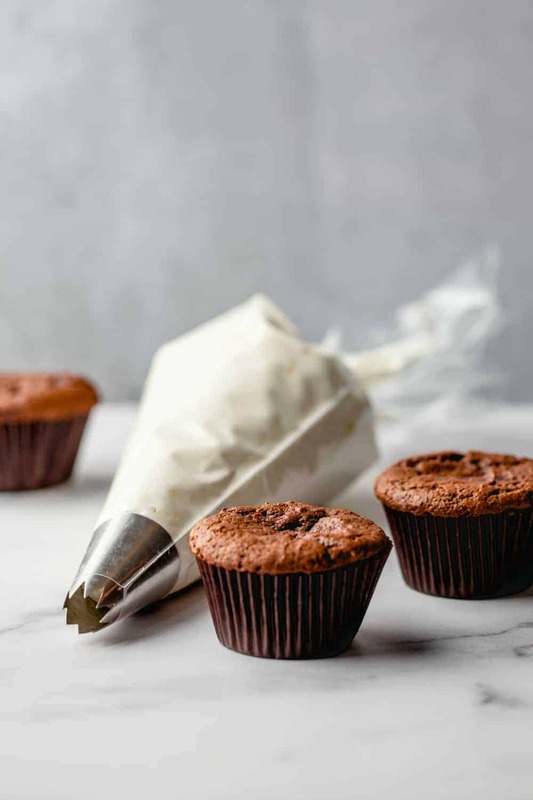 Italian Buttercream – This buttercream is made by adding simple syrup, which is made by heating sugar and water (soft-ball stage) to the egg-whites and allowing the syrup to cook the egg whites and whipped to form stiff peaks. Our Homemade Buttercream Frosting is so easy to make, you’ll wonder why you ever bothered buying frosting. All you need to make buttercream frosting is a big bowl, an electric mixer, and a rubber spatula. If you are using a stand mixer instead of a hand mixer, I recommend using the paddle attachment. Cream the butter until it is fluffy. This is really the most important step in this entire recipe. I often set a kitchen timer for 6-7 minutes and just let my KitchenAid Stand Mixer do all of the work. Then add in the salt and slowly add in the powdered sugar, continuing to beat the mixture until it is well blended. Then add in the vanilla and cream or milk and beat on low speed until combined. Once the vanilla and cream or milk are incorporated, I’ll turn up the speed to medium-high and set another timer for an additional 6-7 minutes. This will ensure your Homemade Buttercream Frosting is ultra-fluffy and creamy. You can add additional cream or milk if you want a softer consistency, but I recommend adding it just a couple of teaspoons at a time until it’s just right. It’s ready to use or store for later! One of the best things about making Homemade Buttercream Frosting is being able to make your own flavored buttercream frosting! There are lots of different ways to flavor Homemade Buttercream Frosting. Of course there is always the classic vanilla extract, vanilla paste or vanilla beans. You guys know I am obsessed with vanilla everything and always use pure vanilla extract; however, this buttercream is the exception. More often than not, I turn to Wilton’s Clear Vanilla Extract for this recipe. 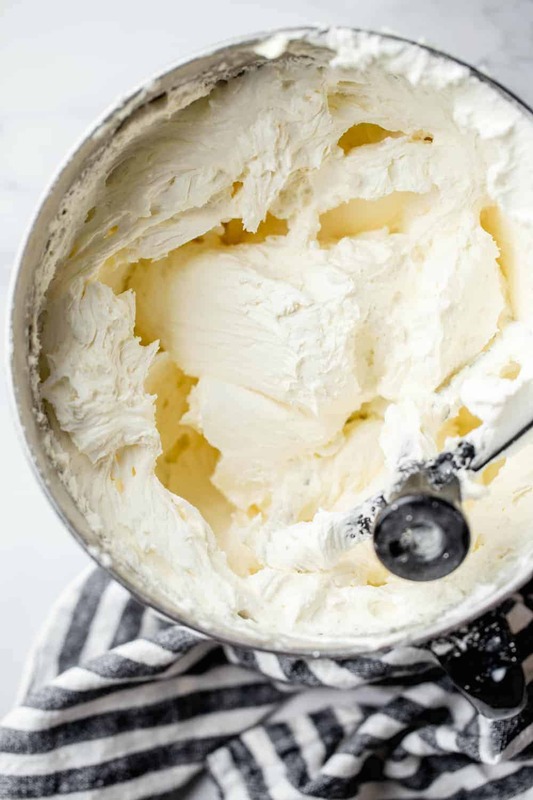 It keeps my homemade buttercream frosting super white and has the perfect, yummy, creamy vanilla flavor that is simply my favorite in buttercream. You can also use any other flavor extract you like, such as peppermint extract. For any citrus flavors, I like to reach for fresh citrus zest or juice. Even though lemon is the most common, you could try lime, orange, or grapefruit instead. I used both lemon and lime for Lemon Lime Cupcakes. 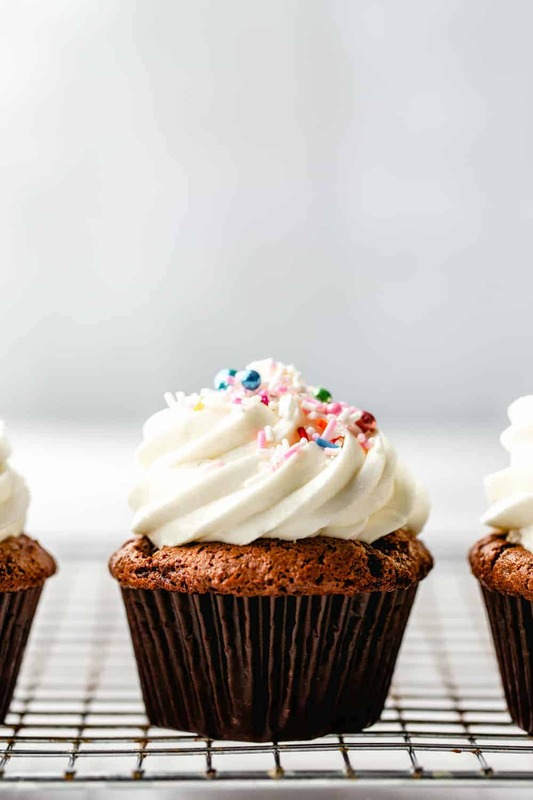 We can’t forget chocolate – you can add cocoa powder or melted chocolate to turn Homemade Buttercream Frosting into chocolate buttercream like I used on Mint Chocolate Chip Cupcakes. You could even try fresh fruit puree (like I did with my Lemon Blueberry Buttercream), jam, curd, or even salted caramel sauce. There are a million different ways to use homemade buttercream. The most obvious is for frosting cakes or cupcakes. This recipe will make enough frosting to generously cover 24 cupcakes or a 9-inch layer cake. 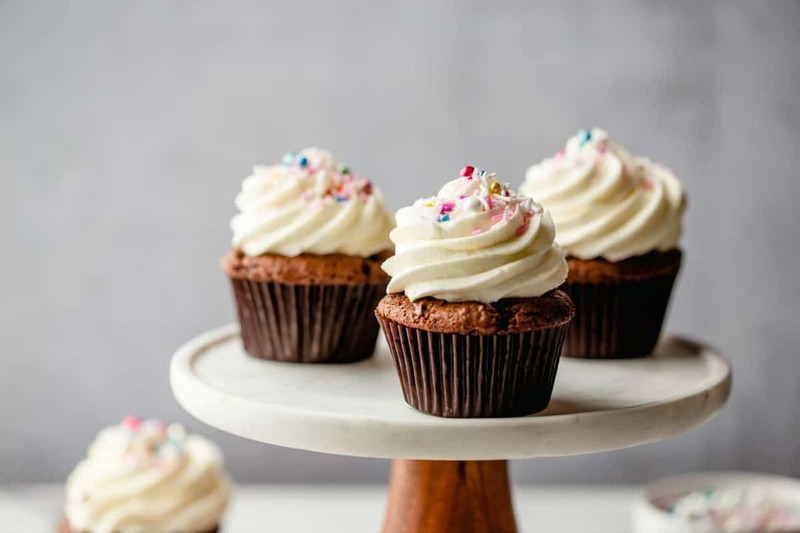 You can also put your homemade buttercream inside your cupcakes! Try using one flavor as a cupcake filling and a second flavor on top. It also makes a fantastic filling for sandwich cookies. Homemade Oatmeal Cream Pies are perfection thanks to a buttercream filling. Really, Homemade Buttercream Frosting can be used for anything that has frosting on top! Think Strawberry Rice Krispie Treats, for example. 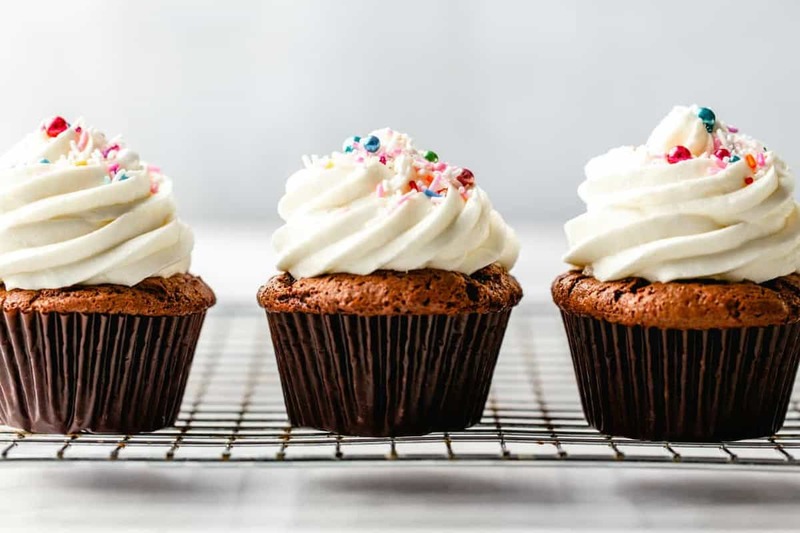 Homemade Buttercream Frosting can be made a few days ahead of time, so it’s easy to prepare before a party and pipe onto a cake or cupcakes the day of. Cover and refrigerate Homemade Buttercream Frosting for up to three days. When you’re ready to use it, simply bring it to room temperature and beat it for about 5 minutes or until smooth. You may need to add a splash of cream or milk to revive the consistency before piping. Homemade Buttercream Frosting is one of the best basic recipes to have on hand. In the bowl of a stand mixer fitted with the paddle attachment, beat the butter on medium-high speed for 6-7 minutes. With the mixer on low speed, slowly add in the salt and powdered sugar, and continue beating until the sugar is fully incorporated. Add in vanilla and cream or milk and mix on low speed until incorporated. 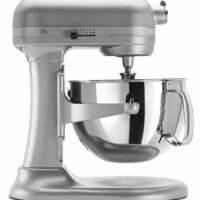 Turn the mixer back up to medium-high speed and beat the buttercream for an additional 6-7 minutes. This recipe will make enough frosting to generously frost 24 cupcakes or one 9 inch layer cake. You can easily adjust the consistency of this recipe by simply adding in more heavy cream or milk. If you are a fan of shortening in your buttercream, simply omit one stick of butter and replace with 1/2 cup shortening. 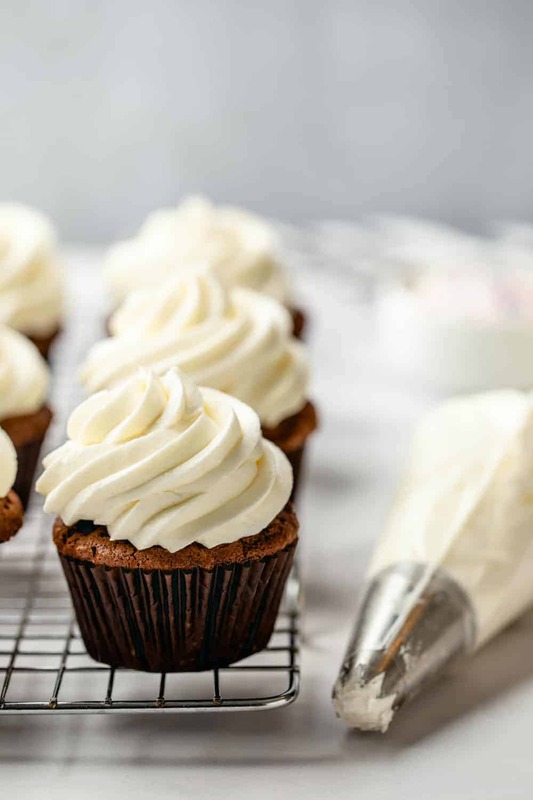 Clear vanilla extract is used in this recipe to keep the frosting nice and white. If you don’t mind a slight color change, feel free to use pure vanilla extract, but decrease the amount to 2 teaspoons. Covered and refrigerated frosting can be stored for up to three days. Simply bring it to room temperature and beat with an electric mixer until smooth. You may need to add a couple of teaspoons of heavy cream or milk to revive the consistency. If you choose to dye your frosting, go easy with the dye. Remember, you can always add more color, but you can’t remove it. Can you make a cream cheese butter cream icing, and how would you suggest doing that? Thank you! I am happy to see that this is a crusting buttercream frosting since I was looking for one and had a hard time finding one that didn’t use shortening! How long should I let it sit before I can expect it to crust? It crusts pretty quickly – I’d say within an hour or so. Thanks for stopping by! Looks like Bake It Pretty is closing down. Do you know where else those tips can be purchased? I am so sad to see Bake It Pretty close down, unfortunately – I do not have another source for these tips, but I am searching. I’d recommend testing out different butter. For instance, I find that Kroger brand unsalted butter is the whitest that I can find. Pair that with clear vanilla extract and you’ll end up with a pretty white frosting. Hope this helps. After your butter cream is prepared. 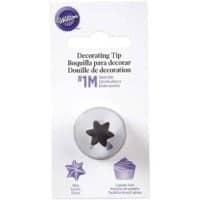 this is crazy but it really does whiten the buttercream – Paddle in the stand mixer – turn the mixer on low speed – and let it stir the frosting for a minimum of 10 minutes 20 is better. It incorporates a lot of air into the frosting and it lightens the color to a very pale off white. You have to whip your buttercream for about 5-6 minutes on medium high speed once all the ingredients are it, and THEN it turns white because of the air whipped in the butter. Great frosting! Just made it this weekend for my son’s bday cake. I did one batch with unsalted butter & one batch with salted butter (was out of unsalted). The salted butter batch came out less sweet (which we liked)!! This recipe is a keeper! Thanks!! I made this butter cream the other day and it came out wonderful! A suggestion… maybe add some where in your posting that butter cream has to stay cool in order to keep its form. I am a beginner when coming to making butter cream and mine had a very thin texture right after making it and once I put it in the fridge for an hour it had the perfect consistency. It easily frosted 24 cupcakes and after frosting half of my cupcakes I added cocoa powder to make a chocolate butter cream. Over all I love this recipe, just wish I had known in advance it neeed to be kept cool but after finding that out I feel like I am better prepared. I will definitely be making more! If it was thin, you probably added too much of the cream. I always start with the minimum amount a recipe says, and add additional as needed (to get the consistency I want). You can always make it thinner, but it’s much harder to get it thick again. It shouldn’t need to be cooled. I made this but it seemed very runny? Not sure what I did wrong. Thanks for stopping by, if your frosting was runny, my best best guess would be that you added to much liquid (milk or heavy cream). I recommend adding the liquid very slowly. Hope this helps. Seriously, these fundamental tutorials are AWESOME! I am new to cooking and baking, and I have made SO many mistakes that would have been solved if I knew a few of these tricks. Thank you for posting these for cooking newbies like me! Thanks for this!! I’m about to make cupcakes for my daughter’s birthday to share with her softball team. I’ll need about that much frosting (if not more if I increase the amount of cupcakes by another dozen) Half will be chocolate (base to represent dirt) half will be dyed green for the grass. Then I’m making little cakeballs dipped in colored white chocolate for the softballs and if I’m so inspired, I’ll make softball gloves out of melted Tootsie Rolls that are shaped. A lot of work, I know, but cheaper than a party for her 18th, right? I just made this for some Easter cupcakes and it is AMAZING!!!! This was my first time ever making homemade icing. I am so excited for everyone to try their cupcakes with this absolutely incredible topping! I had to stop myself from liking the spatula when I was finished. I’m hoping refridger-ating for a day won’t take anything away from its deliciousness! 4 sticks of butter seems like an awful lot. Is that correct? Yes, this is correct. The recipe makes a lot of frosting. Thanks for stopping by! How long would these be good if I served them a day after I’ve made the buttercream? 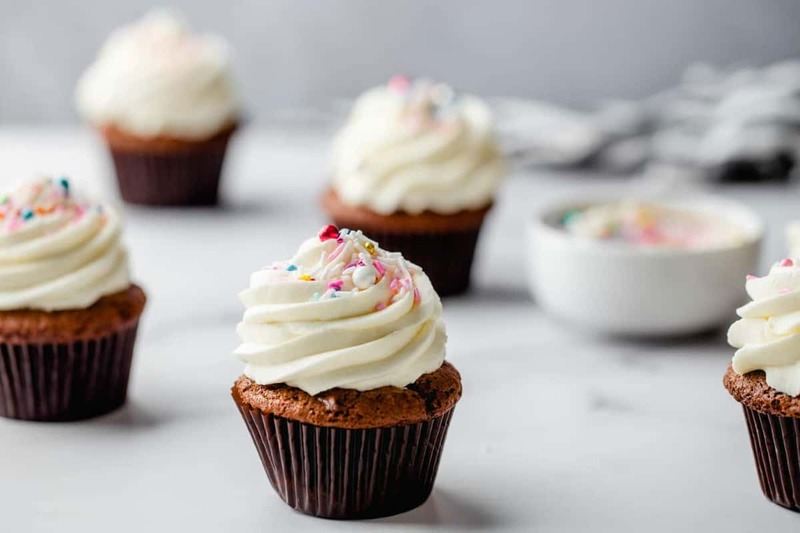 Cupcakes will usually be good for 2-3 days after frosting so long as you keep them refrigerated in an air tight container. Used your fantastic buttercream on a batch of cupcakes tonight. Not sure if i got the measurements exact as out in Aus. we dont use sticks of butter but I was thrilled with the result all the same, and even more excited to have heaps left over! This was a great recipe. Although, I followed your instructions on putting 1 tablespoon of vanilla in it and it tasted toooooooo much like vanilla. Gonna try this frosting, excited because I hate the taste of the buttercream made with shortening! I do have a question, if your going to use flavor in your buttercream like extracts do you still add the vanilla also? I would recommend adding the extracts first – then give it a taste, if it needs a little vanilla, add some in until the flavor suites you! Have a great day. This is a crusting buttercream, so yes, the outside layer will “crust” up a bit. If you are looking for something that will not harden, try a Swiss Meringue Buttercream. I hope this helps. Making cupcakes for my son’s birthday and needed a good buttercream frosting recipe. Sat down at the computer and found this – I love the internet, technology and bloggers! I made 1/2 the amount (kindergartners would just make a huge mess of all of it, right?!). I read that 3 1/2 to 4 c. = 1 lb. 2 cups of powdered sugar worked fine for me to 1/2 the recipe. I frosted 26 cupcakes and I’m licking the bowl! Thanks for sharing – delicious. Hi there pounds makes how many cups or gms? Hello! Thank you for this! I’ve always loved baking but I never *got* how to make buttercream frosting. I followed the recipe/s correctly but for some reason, the last buttercream frosting that I made melted and slid right off my banana cake just a few minutes after I piped it on the cake. I’m not sure if I have to refrigerate the frosting before I pipe it on the cake or something since NONE of the many recipes I’ve read mentioned it. I’m not sure if climate has something to do with it since I live in a tropical country where the normal temperature nearly all year round is 32 deg C. Any advice please? I am sorry you had some issues with the recipe. Typically, refrigeration isn’t necessary, so you may first want to try adding the entire amount of powder sugar and then the heavy cream so you can judge the consistency. This allows you to adjust accordingly. Hope this was helpful! Thanks for stopping by and have a great day! This frosting is fantastic! The notes were very helpful. This is by far the most delicious buttercream recipe I have ever used. Delicious! Infinitely better than the Wilton recipe I had been using. I used high quality vanilla extract DOUBLE strength from Penzeys & I think that really added to the flavor as I still used 1 tablespoon. To my knowledge, clear vanilla extract is all imitation? Thanks so much for the recipe! can you freeze the extra frosting? You are so welcome! The flavors that you made sound amazing! Thank you so much for stopping back and sharing. Have a wonderful day and thank you for following MBA! So here I am again over a year later looking to make more butter cream for birthday cupcakes! This time around it is for my daughter’s 2nd birthday party tomorrow. She is really a 12-12-12 baby, but we are celebrating early this year. This time I am making almond flavored butter cream for chocolate almond cupckakes. Not only does the almond buttercream smell amazing, it tastes great too. As for the marshmallow buttercream and peanut butter buttercream I did for my son last year, I can’t say enough how delicious they both turned out, but the peanut butter icing was by far a favorite!!! Will come back to this recipe over and over again! I’m so glad the recipe works so well for you. Thanks for stopping by. I was wondering if I use this recipe to frost and decorate my sons birthday cake then put it in the fridge overnight, will the icing be hard when i pull it out for the party the next day? The frosting will harden a little in the fridge overnight, but it should soften up if you let it come to room temp for an hour or two before serving. Thank you so much for stopping in and have a wonderful day! I am baking cupcakes for a bridal shower held a few towns over from me. The party planners would like the cupcakes decorated at the location so that none of them get messed up in the drive. I won’t be able to remix the frosting when there and am wondering if it will pipe out ok if I refrigerate it at home in a bowl and scoop it into the pastry bags on site? I’m thinking that the icing will go to room temp in the drive over. Should it hold up or do you have any pointers on what to do? I want it to hold its consistency so that the piping is defined, not be soggy looking or to hard to pipe. Thanks! If that really is not an option, I would put the frosting in tupperware containers and keep it in a cooler full of ice packs for your drive. It will have the added bonus of keeping the frosting cool while you decorate, since it will take a while. This has just become one of my favorite blogs. I too have a baking addiction. Thank you so much! I’m glad you understand :). Have a wonderful day and thank you so much for following MBA! Marilou, you can use kosher salt instead, which is widely available. We made this today and it turned out absolutely perfect and delicious! We added cocoa powder to make it chocolate buttercream and it’s divine! Thanks so much!!! You’re so welcome! I’m happy that you enjoyed the recipe. Have a wonderful day and happy holidays! That’s so great to hear! Sorry for the late response…the frosting will be fine, you’ll just need to stir it and let it come up to room temp before frosting. Have a great day! I love your website! I looked through the comments, but couldn’t find one that asked this question: how much cocoa would you add to this recipe to get chocolate buttercream icing? I know tastes vary, but how much do you use when you do it, and do you prefer cocoa or melted chocolate for the best flavor? Thanks so much for these wonderful recipes. I’ve tried several and my family thinks I’m the best baker ever ;-). Sometimes I use both – it just depends. I actually have a chocolate buttercream recipe coming soon to MBA. Thanks for stopping by! Does a cake frosted with this recipe need to be refrigerated after frosting it? There are several comments about needing to refrigerate the frosting in order to “set” it up. Thanks! Yes, I would recommend refrigerating the cake after it is frosted. Thanks for stopping by. YUMMMM… So stinkin good! It even pipes! And doesn’t taste like plastic. Big big hit here at our house! 4 sticks of butter? Isn’t that a kilogram? Or is a stick different to what I’m thinking? By the way I LOVE your website! It combines so many of my favourite things, namely, ice cream, cheesecake, caramel, nutella and oreos! I’m going to try out your rolo ice cream and nutella butercream tomorrow, and I’m really looking foward to it! But yeah, I need a bit of a hand on these quantities… Thanks! Girl, you are soooooo talented!! I am a subscriber to your YouTube and your blog–you are a blessing to us that want to learn and Iove that you find the time to answer us!! So, I have always made Wilton bc, SMBC and ABC but I just failed “I am Baker’s ” ABC on the patriotic rose cake–disaster!! I had to add so much paste [wilton bcause I was out of Americolor] and still did not get the correct color! It started seperating! you could see the shortening in the icing, ugh! Jamie, any advice? Sorry you had trouble with your icing. You might try mixing it a little longer to make sure it is all incorporated before piping. hi, the buttercream I have made isn’t soft enough for piping roses. it pipes stars great and they hold their shape. But I find its too stiff to pipe a rose as it doesn’t flow out of the bag it just sits exactly where I put it. Am I not beating it for long enough? I have never attempted to make buttercream roses with this recipe. I would recommend the Wilton Buttercream for perfectly set roses. Thanks for stopping by! I love you site, have been baking a few recipes from your site too, and i really love them. :) can i just check, if have a party th following day, would it be okay for me to frost the cupcakes tomorrow and leave them overnight in room temp? Or do i have to chill th frosted cupcakes in the fridge? They’s be fine overnight if your home is on the cool side. If it’s warm, I would definitely refrigerate them. Love your work and your an inspiration to all of us. Could you please convert 4 sticks of butter into Australian measurement. 4 Sticks of butter would equal 16 ounces or 2 cups of butter. I hope this helps. According to Google, 1 stick of butter equals 113 grams, I hope this helps. Thanks for stopping by! Thanks so much! Have a wonderful day. help! 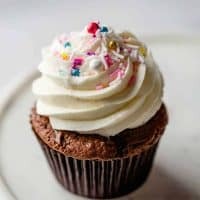 I make butter cream frosting for my cakes/ cupcakes, I use butter not shortening, why does my cakes/cupcakes have a crunchy texture after they sit awhile without being cover, what can I do to gave smooth creamy texture like in the stores. Hi, Elaine! Buttercream does have the tendency to harden after it sits on the cake. Make sure the cake is covered, and the buttercream will probably be softer. Also, maybe try a combination of shortening and butter to see if that softens the frosting a bit. Let me know how it goes! 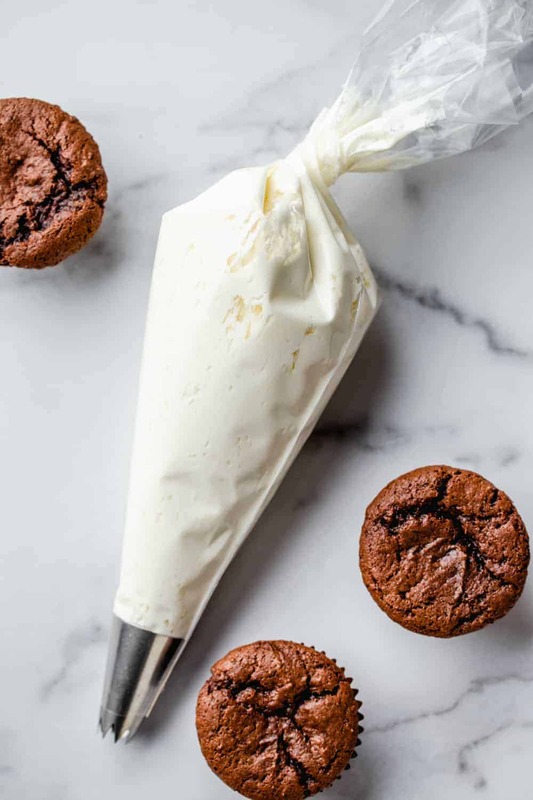 Could you use this frosting on brownie cupcakes? Or if not can u recommend a frosting that is not peanut butter that could go with the brownie cupcakes? I think this frosting would be great on brownie cupcakes, Karla. Let me know if you like it! Thank you for this! I got a buttercream recipe off of Pinterest that totally was horrible when I made it! I made it twice and the first time the milk made it brake down and the second it didn’t harden. I have it my fridge hoping it will but it’s not. I have a wedding that I am making 120 cupcakes for and not wanting to use store bought. I’m a little discouraged but I will try this. I hope you like it, Amber. Good luck with the cupcakes! I love this receipt. I would love to make it a maple buttercream. Can I add Maple syrup to it or just use maple extract? Hi, Tracy! I think you can use maple syrup. Let me know how it goes! I have a quick question, I am making a 2 layer 9 inch cake and your recipe states this will cover one 9 inch cake. I am stacking them so will I need a second batch of frosting? Hi, Olivia! The recipe should cover both of your layers. Of course, extra frosting can be a good thing! I hope you enjoy the cake! I would like to know how much cream cheese would you add to make this into a cream cheese buttercream frosting and I still want to use the heavy cream. Thank you. Hi, Laney! I’ve never tried this, but I would add probably 8 ounces. You can always start small, taste, and add more to your liking. Let me know how it goes! I have a question, and hoping for an answer How is it there is an “Italian Buttercream” frosting when there isn’t anything Italian in it? Just curious how the ‘Italian’ term came to be. I’ve asked Italian friend this question and they had grandmothers that were born, raised, and lived their entire lives in Italy. Neither do their siblings understand why term “Italian” is loosely used. Hi, Michelle! I will admit I don’t know where the Italian comes from in the name. I’m hoping maybe some others can comment and help out! Good but way too much for 24 cupcakes. I’d say about half as much. Hi Estelle – It definitely depends on how much frosting you like on your cupcakes. Some people go crazy for lots and lots of frosting! Thanks for taking the time to comment. Happy baking!